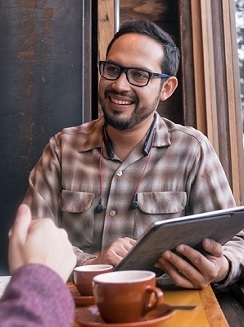 Blog: Earbuds | Avcomm Solutions, Inc.
We've seen EarPods, AirPods and wireless ear buds for fitness and everyday use ... but did you know that Jabra has engineered wireless ear buds for professionals working inside or outside the workplace? The Jabra Evolve 65t ear buds are equipped with microphones for superior conversation, and the included carrying case charges the ear buds on-the-go, while storing the USB dongle. 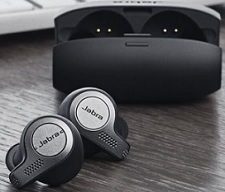 Jabra Evolve 65t was named to Fox News' 10 Top Gadgets of 2018. This listing of top gadgets in each category, including phones, TVs, tablets and laptops, John Brandon of Fox News proclaimed the Evolve 65t sound as good - if not better - than wired earbuds and have the benefit of one-touch access to a voice assistant. We realize that while this wearing style isn't for everyone, it will be great for those who are accustomed to ear buds and like the comfort and subtlety (there isn't an obvious "headset") that ear buds offer. 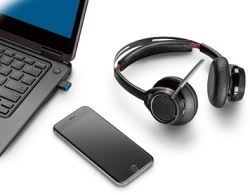 Call our Headset Experts today: 1-866-998-9991 to learn more about the Jabra Evolve 65t. Within the past year, we have noticed the increased frequency of questions about headsets with active noise cancelling. Many customers are familiar with the consumer brands out there that offer Active Noise Cancelling in headphones used for music and other media and are now asking us, “But what about for office headsets?” The pervasive noisy open office environment, as well as the continuing needs of mobile workers handling important calls on the go, provokes the question. Active noise cancelling technology (ANC) will reduce unwanted noise and eliminate distractions. From the headset brands that we carry, there are several choices that, depending upon the connection type, may provide the ANC you need. The Jabra Evolve 75 UC is our top pick for a wireless Bluetooth ANC headset. The large leatherette ear cushions are comfortable and perfect for all-day wear. The speakers rotate to lay flat in the hard-sided case (click here to see the case) that the headset comes in. The noise-cancelling microphone boom arm can be clipped to the headband when you’re not on calls – a magnet secures the boom arm until you’re ready to use it again. Integrated Busylights in the ear cups alert co-workers to your availability – at a glance. ANC is easy to turn on and off with the touch of a button on the left ear cup. The Listen-In feature allows you to keep ANC turned on – yet tuning into the conversation surrounding you – with a simple tap on the left ear cup. There are two certified versions of the Evolve 75: UC and Certified for Skype for Business. The included Link 370 dongle allows you to walk up to 100 feet away from the PC it’s connected to. Talk time is approximately 15 hours. There is an Evolve 75 UC version with the charging stand, which we recommend for those who primarily work at a desk. The stand is a great place to store and charge the headset when not in use. MSRP is $279.00 ($329.00 for the headset and stand). The Plantronics Voyager 8200 UC is the newest ANC wireless headset, and has a contemporary boomless mic design: dual-paired omnidirectional mics with enhanced Digital Signal Processing. These technologies ensure your voice is picked up and background noise is not the focus of the conversation. Dual mode ANC lets you choose preferred noise-reduction level. Smart sensors allow you to answer calls by simply putting on the headset and automatically mute your calls or pause music by taking the headset off. It offers an almost-unbelievable 20 hours of talk time. A carrying pouch is included. The Voyager 8200 UC is available in two colors: Black and White and MSRP is $379.95. 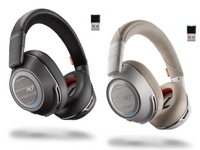 Plantronics Voyager Focus UC is the first wireless headset offering ANC. The Focus UC is compatible with smartphones, tablets, smart watches, and PCs via Bluetooth. It offers up to 12 hours of talk time (10 with ANC on). This is another intelligent headset: Smart sensors answer calls by simply putting on the headset, mute by taking the headset off and pause/resume music. First-to-market Dynamic Mute Alert feature senses and alerts users when they are trying to talk when muted. The sleek noise-cancelling mic can be worn on either side of the head by rotating the boom arm. 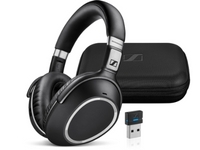 A carrying pouch is also included with this headset; MSRP is $279.95 or 299.95 for the version with the charging stand. Sennheiser’s MB 660 UC has innovative NoiseGard hybrid adaptive ANC that constantly monitors your background environment for noise, thus adjusting the level of noise reduction in the headset seamlessly. Advanced own-voice detector provides optimal speech intelligibility while reducing background noise. SpeakFocus technology, along with the 3 digital microphones, enhances voice clarity in all sound environments. The listening experience can be personalized with the various sound effect modes: Club, Movie, Speech, or Director. The MB 660 UC comes in a hard-sided case for travel convenience. A certified Microsoft Skype for Business version is also available: MB 660 MS. MSRP is $449.95. Wireless around-the-neck earbud wearing styles are the newest addition to the professional office headset market. The Jabra Evolve 75e has an integrated Busylight and magnetic earbuds that connect to pause your music, or end your call. The neckband is silicon rubber and is sweat and water resistant, however, make no mistake: this business headset is made for work. The three-microphone technology provides crystal-clear calls and creates a unique "talk-zone," making sure you’re heard, while nearby voices are filtered out. ANC is activated by pressing a button on the neckband; to "listen in" to your environment, simply press and hold the same button. 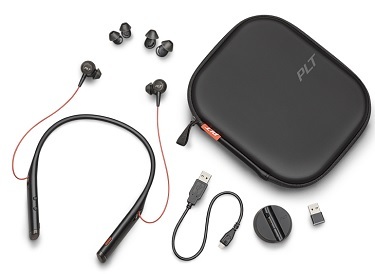 The headset comes with a USB dongle, zippered hard-sided travel case, three eartip and three pairs of both EarGels and EarWings, and includes a desktop charging stand. MSRP is $259.00. The Plantronics Voyager 6200 UC headset features Plantronics clear talk technology, four omnidirectional mics and enhanced noise cancelling, optimizing your voice and minimizing background noise. ANC can be turned on and off with the flip of a switch. Connect to PC with the included BT600 dongle. Also included: a hard-sided, zippered travel case, desktop charging stand, and 3 sizes of eartips for maximum comfort and customization. The Voyager 6200 UC is offered in two colors: Black and Sand. MSRP is $299.95. 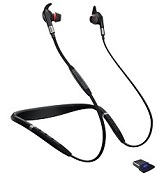 For both of these neckband earbud headsets, the neckband will vibrate when there is an incoming call, so you won't need to keep the earbuds in your ears at all times. Plantronics Blackwire 725 All-day users of PC softphones will like this headset. This is a corded, all-in-one USB headset with large leatherette ear cushions that rest on the ear. It also features a leatherette padded headband for added comfort. 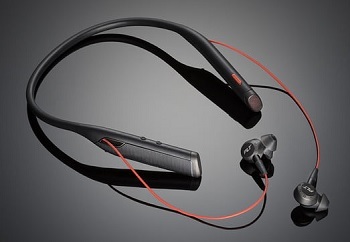 The microphone is noise-cancelling and has a flexible boom arm that can be bent to personalize the fit. The in-line call controller has a built-in clothing clip, soft touch answer/end and mute buttons, a rocker-style button for volume, and on the side of the controller, the ANC on/off switch. Slide the switch toward ANC to activate. Smart sensor technology allows you to answer a call by putting the headset on your head. A zippered neoprene travel pouch protects the headset from damage – either while traveling, or even in the office environment. Download Plantronics Hub software to gain call control across multiple softphones. A headset control panel allows for customizing settings, including call notification. MSRP for the Blackwire 725 is $179.99. 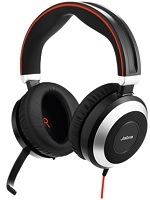 Jabra Evolve 80 This corded headset is compatible with devices that have a 3.5mm port and PCs via USB. Oversized ear cup style cushions completely surround the ear and hug the user’s head. It is the heaviest of the 3 choices, weighing in at 11.43 ounces – almost ¾ of a pound. The bulkiness of the headset could prove to be a deal breaker for some users; however, customers who own this headset don’t mind the heft and comment on its incredible ability to block ambient noise. There is a comfort feature to the headset: the headband has a soft rubber cushion that allows it to lightly rest on the head. Activate ANC at the bottom of the right ear cup. A nice feature of the Evolve 80 is the “Listen In” button: when you have ANC activated, but need to “listen in” to your environment, press the button in the middle of the right ear speaker, to temporarily disable the ANC. Press the button again to resume ANC. The rechargeable battery is charged when the Evolve 80 is connected via USB port. Other features: a neoprene zippered pouch for travel (the ear cushions rotate to lay flat) and a noise-cancelling microphone that mutes automatically when the mic boom is docked in the headband. MSRP: $329.00. Hi-fi stereo sound and wideband audio for listening to music and multimedia applications contribute to the luxury feel of all of these headsets. The very first (and so far, only) DECT wireless headset with Active Noise Canceling is the Plantronics Savi 8220. This headset connects to desk phones, PCs and mobile phones. 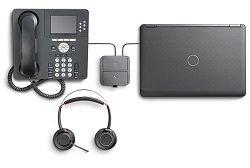 Conference two of your three devices to collaborate with colleagues or connect up to four Savi 8200 Series headsets for training or call resolution. There are 2 versions available: Microsoft Skype for Business certified, and UC. MSRP is $459.95. At this time, ANC technology is not available in QD (quick disconnect) headset versions. We have tested a solution here at Avcomm that has proven to be successful for our customers, and lets you use an ANC headset (Bluetooth or USB) with a desk phone! 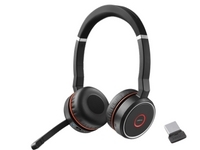 We recommend the Plantronics MDA220 USB, an audio switcher for PCs and desk phones, along with a USB headset of your choice, to connect your ANC headset to a desk phone. Yes, that’s right: an ANC headset CAN be used with your desk phone! And it's important to note that any brand of headset can be used with the MDA220 USB. To learn how the MDA220 USB works alongside a desk phone and PC, along with an ANC headset, read our blog post, here: ANC Headset Compatibility with Desk Phones. Avcomm’s 30-day money back return policy assures that you can try an ANC headset and see if it’s right for you! Call us at 1-866-998-9991 or email us to learn more about ANC headsets. Professional, versatile, and ready for business. Just like you. The Plantronics Voyager 6200 UC is the latest Bluetooth headset for business that offers Active Noise Canceling in the earbuds, for complete concentration. The comfort-fit earbuds come in 3 different sizes, for maximum passive noise canceling - plus the headset features Active Noise Cancellation that can be turned on and off. The option to change earbuds ensures that users will find their best fit. The earbuds should fit snugly inside the ear. You can wear one earbud, or both for stereo sound, or simply wear the neckband and when a call comes in, the neckband vibrates to alert wearers of the incoming call. We tested the 6200 and could not believe how lightweight the neckband is - we almost forgot that we were wearing it! The headset reminds us of popular sports headphones on the market that you see at the gym, but this headset is all business. Four omnidirectional mics have Plantronics clear talk technology and enhanced noise cancelling, optimizing your voice and minimizing background noise. Wear it in the office, in the car, on the train, in a coffee shop ... wherever you work, the Voyager 6200 will help you conduct business like the professional that you are. 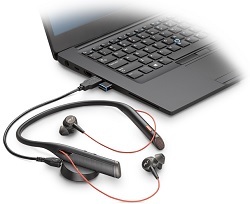 The BT 600 is the USB dongle that connects the headset to PCs. A micro USB to USB charging cable connects to both the headset and the weighted desktop charging stand. It all comes in a hard-sided zippered travel case. This travel case will protect the headset and we like that there is a small pouch inside the case that holds the extra ear tips, USB dongle, charging cable, and if needed, the charging stand. There is much to recommend this comfortable, premium, Active Noise Canceling headset, and professionals who prefer wearing earbuds will want to wear this headset every day! Check out the How-To video below from Plantronics, and contact us today for more information about the Voyager 6200 UC. Communication is Our Business and our headset experts are ready to help!